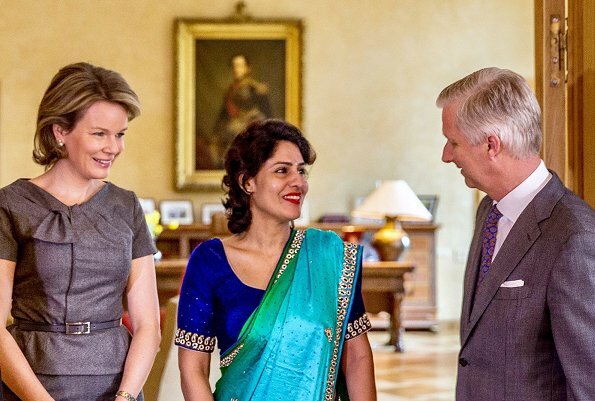 Queen Mathilde and King Philippe welcome Nidhi Chaphekar an Indian airline Jet Airways staff who survived the Brussels attacks and whose picture became an iconic image and made front pages around the world, and her husband Rupesh at the Royal Palace in Brussels. Chaphekar a Jet Airways attendant and mother of two from Mumbai is one of the victims of the attacks on Brussels airport on March 22, 2016. A very nice suit on Mathilde, though it seems a bit tight on her chest. Also... I have some spare blushers here at home, I'd gladly send one over to you, M! It is a nice suit but the top is indeed too tight. And, again, it has that odd high-waisted cut that is not flattering to her. Actually I dont't understand it. Mathilde is a beautiful woman with a good figure. She should be easy to dress for somebody who understands sizes and proportions. This suit was probably expensive and has a good material, but once again it does not fit, bustline, waistline, hipline are wrong. I prefer her natural hairstyle from 2009 to the backcombed and spray fixed helmet of today. Not liking this Suits very much. Mrs. Chaphekar colorful outfit is stunning.. Though I usually find Mathilde very elegant, today she is outshined by Asian beauty. Firstly this color of grey is somewhat institutional and bring memories of uniforms of past times, very few women can look good in it, and it needs jewels and accessories to make it shine, and then the cut of the top is just plain unbecoming, only a woman with perfect measures would have gotten away with it. Personally one of the worst outfits for Mathilde, next to the beautiful dress of their guest she looked even worse. I also like the the 2009 hair better. Loved her hair in 2009, hair now ages her. This suit looks great on her. Apart from being really too tight, the style of the top is not nice at all. 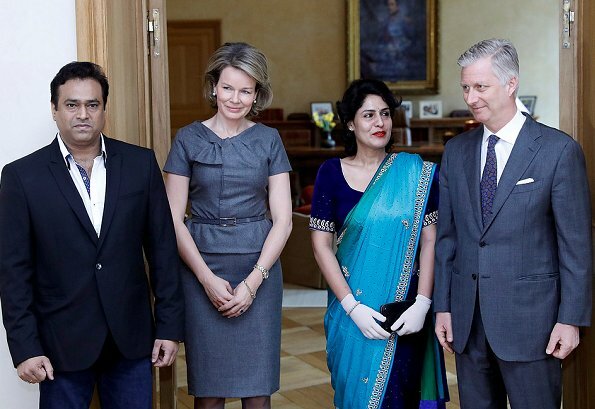 Their guest definitely outshines her, but I am puzzled as to why she's wearing gloves. She wears the gloves because of her injuries, I assume. Natalie I was thinking the same thing.